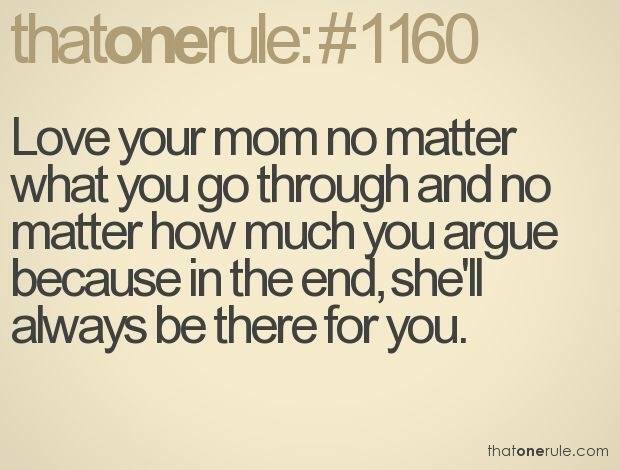 LOVE YOUR MOM NO MATTER WHAT YOU GO THROUGH AND NO MATTER HO - ProudMummy.com the Web's Community for Mums. LOVE YOUR MOM NO MATTER WHAT YOU GO THROUGH AND NO MATTER HOW MUCH YOU ARGUE BECAUSE IN THE END, SHE'LL ALWAYS BE THERE FOR YOU. I hate these posts. Really? My mum was the most spiteful, toxic person I've ever known. I couldnt be more pleased to have cut all ties with her. Hope Jasmine and Joel know that you will always be there for them and their Nan is there as well for as long as I'm around! Not entirely true even mother's can be cruel, nasty and downright horrid human beings. I had one so i know.